Situated in Osterode am Harz, this apartment building is 3.1 mi (5 km) from Osterode Old Castle and within 12 mi (20 km) of Old Town Hall and Gustav Adolf Stave Church. Oker Dam and Unicorn Cave Prehistoric Burial Site are also within 16 mi (25 km). Located in the heart of Osterode am Harz, this hotel is within 1 mi (2 km) of Old Town Hall and Osterode Old Castle. Unicorn Cave Prehistoric Burial Site and Forest Stage Northeim are also within 12 mi (20 km). Osterode am Harz Mitte Station is 15 minutes by foot. Situated in the mountains, this guesthouse is 3.6 mi (5.8 km) from Osterode Old Castle and within 12 mi (20 km) of Old Town Hall and Gustav Adolf Stave Church. Oker Dam and Unicorn Cave Prehistoric Burial Site are also within 16 mi (25 km). 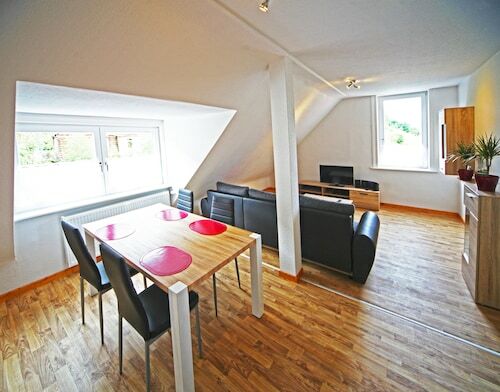 Situated in the mountains, this vacation home is within 9 mi (15 km) of Osterode Old Castle, Old Town Hall, and Oker Dam. Harz National Park and Gustav Adolf Stave Church are also within 12 mi (20 km). How Much is a Hotel Room in Osterode am Harz? Hotels in Osterode am Harz start at per night. Prices and availability subject to change. Additional terms may apply. Within a 6-mile (10-kilometer) radius of the center of Osterode am Harz, on Travelocity's reservations page you can unearth a small, but excellent assortment of accommodations. You can find 3 hotels, apartments and other accommodation options on Travelocity within easy driving distance of downtown Osterode am Harz. Discover the restaurants next to the downtown area of Osterode am Harz. Accommodations around the area include Hotel & Restaurant Zum Röddenberg and Hotel Harzer Hof. The Hotel Freigeist Northeim can be found about 9 miles (14 kilometers) from central Osterode am Harz. On the other hand, the Hotel Riemann is about 12 miles (19 kilometers) away. The Harzhotel im Tannengrund and also the Hotel Njord are alternative accommodation options worth checking out in Osterode am Harz. Like to move a little out of the center? Saxony-Anhalt is home to many beautiful options to check out. Saxony-Anhalt is well known for its forests, rivers, streams and lakes, and other popular destinations include castles and old towns. Common pastimes in this region of Germany include snowboarding, skiing and cross-country skiing. Looking for more activities? Consider spending a few hours visiting Goslar Imperial Palace and Mines of Rammelsberg, in Goslar, 15 miles (25 kilometers) northeast of Osterode am Harz. 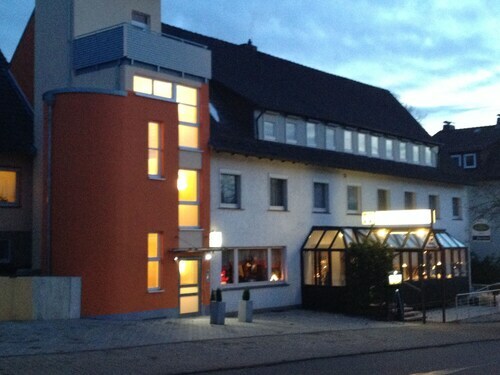 The Altstadt Hotel Gosequell and RAMADA Hotel Baeren Goslar are a handful of the great accommodation options in Goslar. 20 miles (32 kilometers) east of Osterode am Harz, you will reach Sorge, which features the Hotel Tannenpark and Landhausferienwohnungen Am Brockenblick. The Grenzlandschaft and Museum Sorge and Ring der Erinnerung are a couple of the most popular places to experience when you're in Sorge. Why not spend an afternoon enjoying the spectacle with sports fans at an engaging game. HDI Arena is located 50 miles (79 kilometers) to the northwest of Osterode am Harz. Wise travelers who like the thought of sleeping close to the game, book a room in the Cityhotel Königsstraße or Sheraton Hanover Pelikan Hotel. Located 55 miles (90 kilometers) from the downtown area of Osterode am Harz is Hannover Airport. Base yourself in the area at Leonardo Hotel Hannover Airport or Maritim Airport Hotel.